Nearly every day we come across a situation where we must decide if it’s smarter to hire professionals or if we’re going to do the job ourselves. Think of it…should I file my taxes myself? Should I cut down that dead tree in the backyard myself? Should I pull this tooth myself? Ok, the last one may be a big extreme, but you get point. It just depends on how comfortable you are doing the job and if it’s more economical to do it yourself versus hiring a pro. Here are a couple of questions to consider if you have junk that’s got to go! How much junk do I have to remove? This is the first question because it has so many ramifications. If you don’t have a vehicle big enough to carry the junk to the dump, you’ll likely have to rent something to carry it in. Also, what if it’s heavy? Do you have friends that will help you load your junk? If you rent a dump trailer, you can load it with a few friends at your house but this will allow you to unload at the dump with the push of a button. They can make your life easy and keep your friends happy. Read a little more about dump trailers here! Hiring a professional junk removal company is a big decision. But, think about the old saying…time is money! How much is your time worth to you? 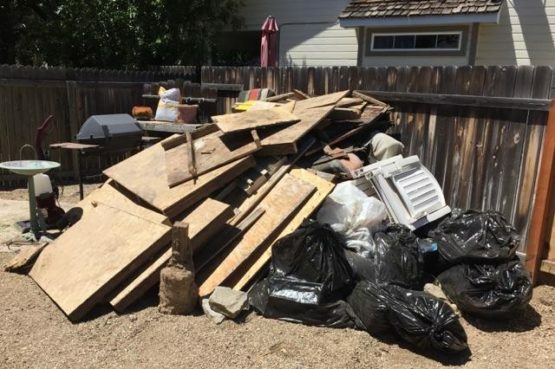 If you don’t mind dedicating a few hours to a junk removal project to save the money, then that’s probably the right move! However, if you value your free time, hiring a pro will be the way to go. For instance, a quarter of a truck, or about 5 cubic yards of junk will cost you around $100. By the time you’ve loaded the truck, driven to the dump, unloaded, and paid the fees, that $100 is looking like a sound investment! Follow this link to get more ideas of prices. These are just a couple of things to keep in mind when you have a pile of junk that needs a new home. It all comes down to how much effort you want to put into the project. If you’re a do-it-yourselfer that can tackle just about any project, it’s unlikely you’ll need to hire a junk removal company. But, if you’d rather spend your weekend fishing or playing golf, hire a local company to remove the junk and you can get your weekend back!